Play Immortal Romance Online Slot - ▶️ 243 Ways to Win! Immortal Romance slot is a vampire themed slot from Microgaming, inspired by the many movies and TV series featuring vampires that have become common place in the last few years. This game is a 5-reel, 243 ways to win slot that has plenty of features to sink your teeth into. So, without further ado, let’s see what this slot from Microgaming has to offer! If you are used to bright and colorful, cartoony video slots, then you’re in for something completely different. Immortal Romance features a mysterious, dark, gothic design and has attractive characters as the heroes. It has a look and feel that you can only get from a vampire-themed movie. Immortal Romance boasts 243 ways that you can win and includes multipliers, wilds, the Wild Desire bonus and the Chamber of Spins, which reveals its secrets as you go deeper into the game. All the game’s decorations, the arrangement of the different symbols and playing cards come together to bring a dark fantasy world to life. There are also four characters within the gameplay action, each having their own feature in the Chamber of Secrets and a unique symbol. Playing the base game is easy and fun. 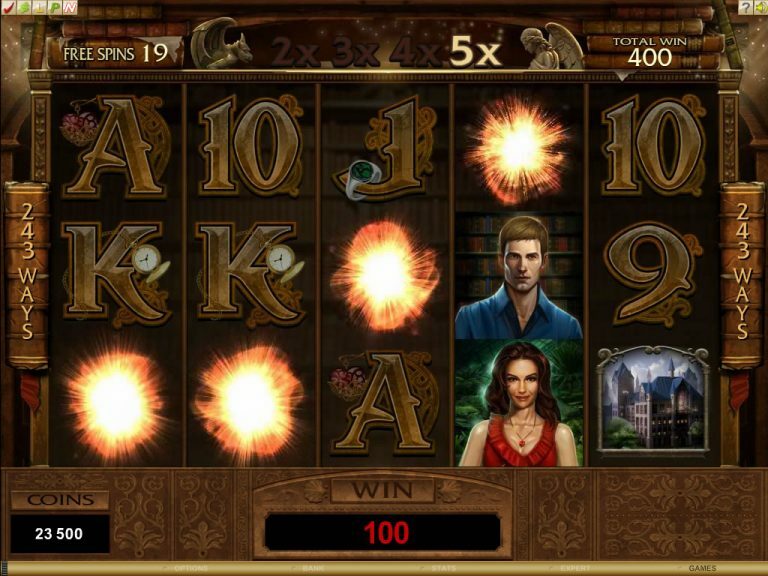 The Immortal Romance slot is certainly not short of different symbols, and sport 12 regular gameplay symbols, plus a wild, and scatters. The Immortal Romance slot’s logo is wild and helps you to achieve extra winning combinations, plus doubles the win amount. The lion door knocker scatter symbol is another crucial symbol in this slot. Firstly, with five scatter symbols on the reels, it is possible to win up to 200 times your stake in that particular round. But, more importantly it unlocks The Chamber of Spins with its various Free Spins features. The top paying symbols are the various characters from the story, the mansion and a hand-written letter. On the lower end are 9, 10, J, Q, K, A. An interesting addition to this game is the randomly-triggered Wild Desire feature. When it is triggered, between 1 and 5 of the reels will become wild, offering you plenty of extra chances to win big prizes. What you should keep in mind is that when playing the Wild Desire bonus, you cannot trigger free spins. The Immortal Romance free spins is called the Chamber of Spins, which is triggered when 3,4 or 5 Lion door knocker scatters appear within the reels. This fun feature gives you up to four kinds of free spins. The number of spins is determined by the number of times you have previously triggered the feature. Amber Free Spins – this is awarded the first 5 times you enter the Chamber of Spins, and you will receive 10 Free Spins, plus all wins are multiplied by five. Additional free spins can be retriggered as well. Troy Free Spins – this is awarded from the 5th time you enter the Chamber of Spins and gives you 15 Free Spins with the Vampire Bats Feature. The vampire bats can randomly turn symbols into multipliers ranging from 2X to 6X. Michael Free Spins – available from the 10th trigger of the Chamber of Spins. With Michael, you will enjoy 20 Free Spins with Rolling Reels, which can award multiple consecutive wins, plus consecutive wins increase the winning multiplier up to 5X. Sarah Free Spins – Only available from the 15th time you enter the Chamber of Sins, this round gives you 25 Free Spins with the Wild Vine feature enabled. The Wild Vine will appear on reel 3 and transforms symbols into additional substitutes. If you’re interested, the different characters within the game each have their own unique story to tell and you can view their stories when you click the “Story” button within the pay table. The paytable has an advertised jackpot of $6,000. There are no traditional betting or pay lines, instead, Immortal Romance gives you a total of 243 possible winning variations. The theoretical Return to Player rate of 96.86% is a satisfying one for an online slot. This is a medium to high volatility slot, so you should be patient for the free spins features where you will be able to rack up some decent wins. If you are a big fan of vampire movies or TV series, particularly the newer ones which seem to have only supermodels as actors, then Immortal Romance will be right up your alley. Throw in the impressive list of extra features, multipliers and an excellent design, and Microgaming has a winner in this slot.